These are soft tanned rabbit strips that have been expertly cut to meet specific fly tying needs. They are half rabbit skins that have been pre-cut into zonker strips. They are available in a variety of cuts (strip sizes) and colors (see list of available colors below). The Thin cut, Standard, and Cross cut zonkers are ideal for trout and most bass flies. The Magnum and Texas cuts are perfect for the largest bass, pike, and saltwater flies. The standard cut have 1/8" wide strips. The thin cut is 1/12", cross-cut is 1/8", magnum cut is 1/4", and Texas cut is 3/8". Minimum order is 100 half skins. We currently have red 1/8" in stock. We can get other cuts and colors pretty quickly. White, Natural brown, Chinchilla, Charcoal gray, Yellow, Orange, Tan, Dyed Ginger, Golden Brown, Rusty Brown, Red, Leech Red, Dark Brown, Olive, Purple, Black, Flesh, Fl. red, Fl. yellow, Fl. orange, Fl. chartreuse, Fl. pink, Dark olive. These have been bar dyed for two-toned zonkers. 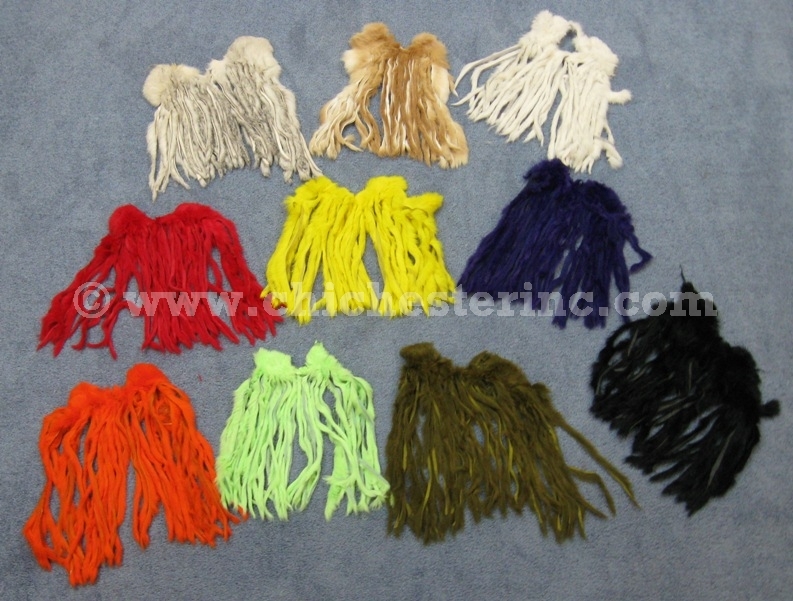 White, Cream, Yellow, Crawded orange, Tan, Red, Light olive, Olive, Purple, Shadow gray, Fl. red, Fl. yellow, Fl. orange, Fl. chartreuse, Fl. pink.